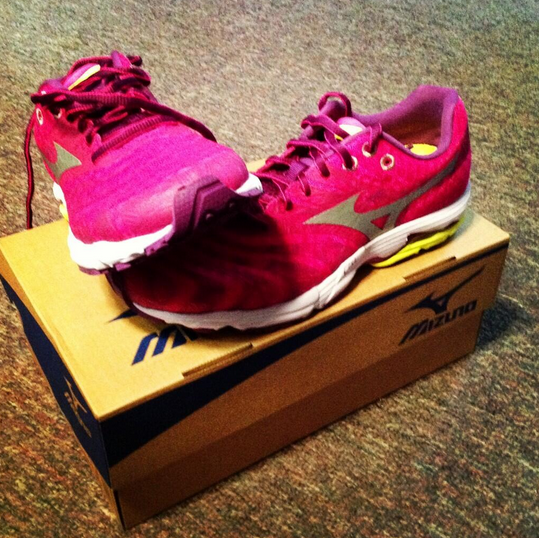 The Middle Miles: Gear Review: Mizuno Wave Sayonara and GIVEAWAY! 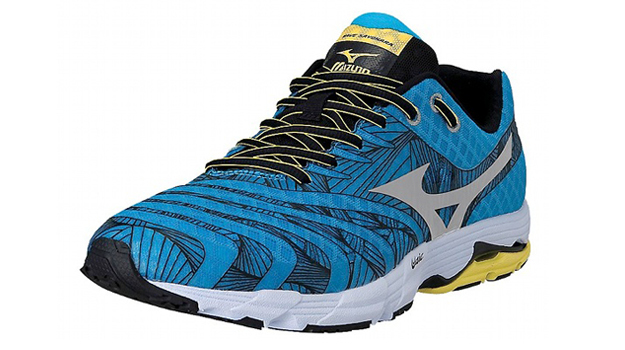 Up until now, Mizuno has offered two performance trainers: the neutral Wave Precision and mild stability Wave Elixir. However, with everyday trainers getting lighter and lighter, there was increasing overlap between the 9.9oz Wave Rider and 9.6oz Wave Precision (I'm not sure whether Mizuno felt the 10.1oz Wave Inspire was encroaching on the 8.8oz Wave Elixir or if they just wanted to streamline their line). So instead of slimming down its current performance trainers, Mizuno went back to the drawing board, seeking to create a new neutral performance trainer that still had enough inherent stability as to not disappoint Elixir fans. The new shoe is the Wave Sayonara, a lightweight shoe with a clever name that gives a nod to the old Wave Goodbye racing flat of the early 2000s (interestingly enough, today's Wave Sayonara performance trainer is lighter than yesterday's 8.7oz Wave Goodbye racing flat). The Sayonara is a moderate feature, moderate neutral shoe designed for training and racing. Printed Overlays on the medial and lateral sides help hold the foot in place. G3 Sole consists of a lightweight rubber dot pattern in the forefoot for increased grip and flexibility. While I have not worn the Wave Elixir, I have quite a few miles on the Wave Precision, and can say that the Wave Sayonara is a big improvement. The biggest and most welcome change is the improved balance of the shoe. The Precision always felt slightly back-heavy. Not so with the Sayonara, which is much better balanced fore-aft. This makes it feel much more natural during swing-phase than its predecessor. The Wave Sayonara continues the Mizuno tradition of having a great upper. The upper is seamless and is comfortable both with and without socks. One thing to note though, is that the toebox is very low-volume and shallow. This may be due to the fact that the Sayonara does not have very much toe spring compared to many of its competitors. This gives the toebox an odd feeling when you put on the shoe, but thankfully goes away once you start running. What doesn't go away, however, is the narrowness of the forefoot. The fit is similar to that of the Wave Rider and Saucony Kinvara, in that it's a bit snug through the metatarsal heads, and I sometimes find myself wishing the Sayonara had the roominess of the Precision's forefoot. I had to do some lacing-magic to get the Sayonara to fit me, but this lacing did seem to relieve the problem. The Wave Sayonara ditches the AP+ midsole foam that was used in the Wave Precision in favor of U4ic. Marketing-speak for sure, so how does it feel? For a shoe of its weight, the Wave Sayonara has a surprising amount of forefoot cushion, nearly as much as was present in the noticeably heavier Precision. However, the heel is much firmer...not quite in Wave Ronin firm territory, but definitely firmer than the Precision. This makes for a smooth ride (albeit a less forgiving ride than with some softer shoes) for forefoot strikers, midfoot strikers, and mild heelstrikers, but severe heelstrikers may find it a bit jarring. Additionally, the entire shoe feels surprisingly low-slung and close to the ground compared to the Precision. The Wave Sayonara is a very flexible shoe, with a nice, smooth flex through the forefoot and a good amount of torsional flexibility. The wave plate is thin and far enough back that it doesn't seem to get in the way of your foot moving how it wants. As mentioned before, the Wave Sayonara does not have the sprung toe that is found on many other performance trainers. I usually prefer my shoes to have a slightly sprung toe, because I think it makes for a smoother transition, but the Sayonara's forefoot was flexible enough that it wasn't an issue for me. On the other hand, I know there are plenty of forefoot and midfoot strikers who prefer their shoes without a sprung toe, so they'll be happy here. The Wave Sayonara also has a firm heel counter to add a little bit of rearfoot support. The Wave Sayonara has a full-contact outsole, in that there is continuous rubber on the ground linking the front and rear of the shoe. This is something that's also seen in shoes like the Brooks Launch, and gives it a super smooth ride. It seemed a little strange to me to put the connecting rubber on the medial rather than lateral side (or having it on both sides), but it rides great, so whatever. Mizuno also says that this feature also gives the Sayonara more inherent stability than the Elixir. Since I haven't worn the Elixir, this is impossible for me to compare (I am told that the stability is there if you need it, and if you don't, it doesn't get in the way, so take that for what it's worth), though I do have to say that the Sayonara feels pretty neutral to me, or at least more neutral than the mild stability shoes I've worn, like the Brooks Racer ST 5 and Brooks PureCadence 2. Full-contact outsole on the Mizuno Wave Sayonara (yellow is flush with the ground). You can also see the horseshoe-shaped heel surrounding the exposed purple Wave plate. The Wave Sayonara retains the horseshoe shaped heel with the indention for the "Mizuno rock" (aka the rock that gets stuck where the wave plate is exposed). C'mon Mizuno, the Universe doesn't have that, cover it up! Please? Minor gripe, and Mizuno wearers are probably used to it, but it still annoys me when rocks get stuck in my shoes. In addition to being a solid performance trainer, the Wave Sayonara seems like it also has the potential to be a perfect marathon shoe (or heck, even half-marathon shoe) for runners who don't quite want to go racing flat, but want something significantly faster and lighter than their trainers. Just make sure you use it for speedworkouts before race day (the Sayonara very clearly has speedwork in its blood, so you're good there). At 8.1oz, it's as light as many flats were just a few years ago, and it has a fast feeling to it without losing the protectiveness of a trainer. Everyone who knows me knows that I love the Brooks Launch, but for fast days, the Sayonara feels faster. It's not nearly as forgiving as the Launch, so the Launch is still my #1 easy day and recovery day shoe. However, the Sayonara has a faster response and transition, and the Sayonara is over an ounce lighter, so I'd probably choose it over the Launch for faster running. The Wave Sayonara is a big improvement over the Wave Precision, and I've been enjoying it quite a bit. It has a smooth ride, fast transition, and good response, and has a more natural-feeling balance than its predecessor. I don't think that Precision fans will be disappointed with the replacement, and I think that Mizuno has the potential to convert runners to the Runbird with this shoe. The one stumbling block that I foresee is getting runners into them in the first place, since at $120, they're $20 more than the Saucony Kinvara and $30 more than the Brooks Launch, both of which directly compete with the Sayonara. For what its worth, the Sayonara seems to be more durable than both the Launch and Kinvara (at least from what I'm seeing so far), so it may (or may not) even out in the end, but that's sometimes a tough sell at the register. Regardless, given the chance, I feel the Sayonara is a solid entry in the performance trainer market for runners seeking a fast-feeling, responsive neutral shoe, and can also potentially work as a marathon racer for people who want a light and fast shoe yet still crave the protection of a trainer. The Mizuno Wave Sayonara retails for $120 and is available on Mizuno's website (or will be after 7/5/13), as well as at running stores that carry Mizuno products. It seems to fit true to size, though I have heard of some people sizing down half a size due to its not having a sprung toe (my recommendation would be to try them on first, and if that's absolutely not an option, I would say try true to size due to the low-volume toebox). If you have a wide forefoot, you may want to try this shoe on first, since it does run narrow through the metatarsal heads (the bony part of your foot just proximal to your toes). Full disclosure: The Mizuno Wave Sayonara was provided free of charge by Mizuno in exchange for a review. The opinions contained in this review are mine and based on my experience, and do not reflect the opinions of Mizuno or anyone else. I have worn Wave Universe 4 which I chose as part of the Mezamashii Project. I've enjoyed your comments on the Running Shoe Geeks page on Facebook. Love your shoe knowedge. Good to hear they're balancing the shoe better throughout the sole! Mizuno is certaintly doing some interesting things!! I'm also excited for the Wave Universe 5. Very helpful review! I have used Mizuno's for about 2 yrs now and love them. I currently run in the wave inspire 9. Good feedback. You provide information that I have yet to read in other reviews. I appreciate your comments on pricing and the discussion concerning the toe box area. Thanks! This would be my first pair. These seem to be a really great complement to a pair of Karhu Flow 3s that I am currently adoring. Thanks for the review! I've been Mizuno obsessed for a while (the Rider being my standby for long runs, and the Ronin being my go-to for all races up to the marathon), definitely see the Sayonara in my future. A shame to have missed a few months with injury this year, makes it a little harder to justify getting a pair at launch. All the buzz has been so positive, I'm sure I won't be able to hold out for too long! I started running in the wave rider 15 le. and wore test the BEs. I used to run in the Creation and Alchemy exclusively for years, but I've since gravitated toward the GoRun2 and several NBs. I'm thinking it might be time to revisit Mizuno. Thanks for the great review! Started running in the Rider 14 3 years ago - can say the Sayonara definitely complements the Rider 16 almost perfectly for track days and tempo runs/SOS runs in the Hansons plan. I have never tried Mizuno but I am very interested!!! I wear the Wave Precisions so I am really interested in this shoe. I'm sad to see my shoes being retired, so hopefully this one will work for me. Otherwise, I guess I'll have to find another shoe or brand, and I'd hate to do that because I love Mizuno. I'd love to win it too- thanks for hosting this giveaway. I currently wear Mizuno Wave Rider 15s and was anticipating getting some 16s in the next few weeks.....but now I'm toying with the idea of trying the Sayonaras! Thanks for the review! I've been a Wave Inspire wearer for the last 7 years and it's ridiculous how much I love them (and how much I've hated every other non-Mizuno shoe I've tried). I'm intrigued by the Sayonaras because I've raced up to a half in the Mushas, but don't think they'd be enough for me for a full. So I would love to give them a try! I run in the Elixir and am mighty curious about this shoe! I'm interesting see if this shoe really offers enough support. Appreciate the review! Thanks! I've run in quite a few mizuno's - wave rider, universe, musha. Hoping to run in the Sayonara soon! Never tried Mizunos so this would be a first for me! Thanks! I have found your shoe reviews so useful in the past, and this one is no exception. As a high-mileage runner with a wide forefoot and increasing bunion issues, I'm really disappointed to see the Precision be replaced with something noticeably narrower in the forefoot -- thank you so much for including that detail in your review. I might try on the men's Sayonara instead. Men's will be D width (women's is B). Size down 1.5 sizes, and hopefully that'll work. Other than the forefoot width, I really think it's a better shoe than the Precision overall, but sadly, a shoe that doesn't fit you isn't a good shoe for you at all. Good luck! I have Precisions in my current rotation and my only gripe is the heel height. It sounds like the high heel has been addressed. I'm super interested. I wear the wave inspire 8 and also like the elixir. I'm new to Mizuno and would love to try out the Sayonara! I've never tried a Mizuno so this would be my very first pair! This would be my first pair! My wife runs in Mizuno Inspires right now as her daily trainer, these would make a great long distance racer for her. Haven't worn them, but they're next on my list. It isn't often that I get to buy new shoes (new baby at home), but normally I go really cheap :) Thanks! I've never worn a pair of mizunos before, so if I win, this will be my first pair!!! They look awesome!!! I haven't worn any Mizuno shoes, but am eager to try the Sayonara! I recently picked up a pair of Brooks Launch and am digging them for my easy runs. My other go-to shoe is the Brooks PureCadence 1, which I've used for everything from speedwork to long runs since December. I'm hoping that the Sayonara will be a nice addition to my current rotation. Thanks for another great review! I appreciate thoughtful, technology-focused reviews, and yours' are some of the best out there! I've worn the Inspire, Elixir and Musha, love them all! Never worn Mizuno before, but would like to! I am entering for my daughter Catherine. She has been ill for the past year, and is now starting to get back on her feet. She has never had any Mizuno's and think the Sayonara's would be perfect for her to try! I currently run in the Wave Rider 15s, but would love to try this new style! I have run in various Wave Riders and Wave Precisions. Can't wait to try the Sayonaras. I'm a fairly new convert to Mizunos. I've been running in Wave Riders for about a year. Awesome review and thanks for including the photos! I've been interested in Mizunos for a while now so would like to win the Mizuno Wave Sayonara and see how they perform! The first time I got fitted was this past January and my running store put me in the Wave Inspire. I always thought it was a bit clunky, so I'd love to try this Sayonara especially when I'm doing tempos/track work. I've come a long way in my running since January and it is time for my shoe to catch up. :) Love the review btw. these would be my first, fingers crossed! Never run n Mizunos, but I'm shopping for a new pair of kicks for 3 upcoming half marathons. These sound like a great option for me. Great review, thanks for the in-depth info. I currently run in the wave rider 15 and wave elixir 8. I would love to try the new sayonara! I currently run in the Mizuno Inspire 8's. I have wanted to try a lighter shoe for speedwork and racing so badly and these look like they would fit the bill. I would love to win these. Also, thanks for the awesome review. It was very detailed, thorough and well written - not just stock answers found from their website. 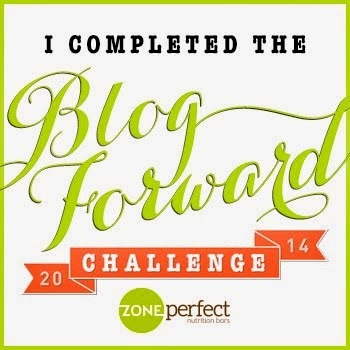 Taking the time to write what you did is greatly appreciated! I have 3 pair of Wave Rider 16s, and would love to try out the Sayonara as well! currently rocking the wave rider 16s! I trained for my first half in Mizuno Wave Rider 16s that I got for Christmas. Loved them so much I ran another Half & 10 miler in them. I'd really love to try these beauties!! I got a Wave Ronin from them as a part of the Mezamashii Project and absolutely love them. I can't wait to try the Sayonara once it comes to a local running shop. GREAT review! I love my Wave Riders, but these would be the perfect compliment for speed work and the MCM this fall! Never worn mizunos but would love to! I would love to give these to my husband for his birthday on July 8! He loves Mizunos! Dang it, I really need to try these! Perfect thing to jumpstart my training for the fall race season! Great review! I currently love my Wave Rider's and have been wanting a lighter, more flexible shoe that still provides support..I think the Sayonara is just what I need. I've worn Mizunos before and always liked the quality feeling of the shoes. I have been running in wave riders for three years and absolutely love them. I got a chance to try the sayanora at the Peachtree expo and I would LOVE to have a pair to switch out for speed work and races. I will ONLY run in Mizunos! The Wave Rider and Wave Precision are my favorites! I used to love the Precision (11-13), but then I discovered the Wave Ronin (also thanks to one of your reviews, lol) and converted to those, but they always felt too hard for easier/longer runs, so I kept wishing Mizuno would release a mashup of the two. And it sounds like they just did :) Thanks again for the review, I can only purchase Mizuno online and it made my decision so much easier. One quick question though, compared to the old Precisions, is the sizing the same? I had to order the Ronin half size up to fit well. Tough one, because I wear the same size in the Precision, Ronin, and Sayonara (the only one that I have to size up is the Universe). I know there's been some debate on the sizing, with some people (like myself) going with their normal size, and others sizing a half size down due to the Sayonara feeling "longer" because it doesn't have a sprung toe. Honestly, sizing down wouldn't fit me, so I'd go with width as your indicator. If you had to size up in the Ronin due to a width issue, definitely go with the larger size, because the Sayonara has a snugger, more performance-minded fit than the Precision. If it was a length issue, you may be alright with your Precision size. Since it sounds like you don't have a local shop where you can try them on first, I'd suggest ordering from somewhere that you know is good about returns, just in case. Thanks for the insight! It was more of a width problem with the Ronin, but then again it almost completely went away after I switched to some shoelaces that are actually usable (I've had the exact same problem with the Wave Musha - what's the deal with the horrible shoelaces on some Mizuno shoes?). But if you say that it's just a more cramped toebox, I'll try my usual size first. I have never owned this brand before, so it would be my first pair! I love my Mizuno Wave Rider 15s, and am looking to replace mine soon! Great review! Sounds like a great pair of shoes. These would be my first Mizuno shoe. Awesome review! I currently have a pair of wave inspires, but would love to add these to my rotation! Thanks for all the great info! I can't wait for my pair to arrive! I'm an aspiring triathlete (inspired by my cousin who races in the Ironman) and have just started training in running. I was able to get a pair of Mizuno Wave Rider 15's on sale recently and absolutely love them! They are the best shoes and their comfort alone makes me love going out to pound the pavement! I've never worn Mizunos before so this would be my first. I've got a pair of Mizuno Wave Creation 12s that need to be replaced ASAP -- looking for an awesome Mizuno update! I love Mizunos, would love to replace my Inspires with the new Wave Sayonara!!!! Awesome looking pair of shoes! How the Sayonara compares to Green Silence and Ronin? Firmer than the GS, softer than the Ronin. Has a more "trainer-ish" feel than both. Upper also fits very differently. Thx Becki, I really love your gear reviews. I love to buy this shoes from online footwear stores !!! Took my first run in this shoe yesterday. Completely different from both the Elixir and the Precision, but a worthy successor. The ride is firmer and the shoe is much more stable. I'm a modest overpronator, but my gait in this shoe (seen on camera) is 100% neutral. The reduced midfoot volume of the upper is my only initial con; I'm hoping it'll loosen up some with time. Keep us updated on how they work out! Think I'll try your "lacing magic" to see if that resolves my snug midfoot gripe. Actually, I guess it's more forefoot tightness, since it encompasses the area from the ball of my foot into the instep. I experienced similar to a lesser extent with the Pure Cadence and its so-called Nav Band, but that shoe loosened up on subsequent runs without any lacing mods. Definitely worth a try. I can't wear it at all with it laced normally. It made all the difference, Becki. Thanks! I had a wonderful eight miles in them this evening. currently breaking in my pair of sayonaras. started running on wave inspire 6. loved them. so i immediately bought another pair after a month of running on my original pair. bought the ronin2 last year, and they are great. ran a couple of half marathons with them. was supposed to buy another Ronin last week. but i hated the colorway. ended up buying these sayonaras instead. nice blog/reviews you have here. thanks for the reply Becki. hopefully they don't disintegrate. i bet not.